Comfort food. Our bodies begin to crave it as the winter months crawl towards us. Unfortunately, these months are the most important for healthy eating and in most cases, healthy food is not what we want. This dish is perfect if you want a cheesy pasta dish that will soothe your cravings as you get your greens. With a cook time of 30 minutes, this recipe is delicious and easy for a simple weeknight dinner or a weekend dinner party. Heat the sun-dried tomatoes and 1 tablespoon of oil in large skillet. Cook on medium heat, add minced garlic. Add fresh spinach and stir on medium heat until spinach starts to wilt and then add half and half, 1/4 teaspoons of salt, paprika and bring to a boil. Reduce to simmer and add mozzarella cheese. Stir to melt. Add chopped fresh basil. Cook tortellini according to package instructions, drain, rinse. 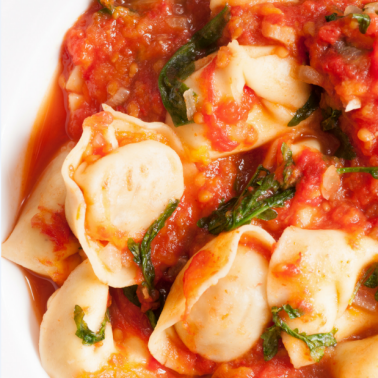 Add cooked tortellini to the sauce, mix and warm on medium-low heat. Taste and add more salt if needed.